which features audio samples and video clips! September 12, 2012 at 7:15 p.m.
Rosenthal JCC of Northern Westchester, 600 Bear Ridge Road. in New York City, conducted by Binyumen Schaechter. No knowledge of Yiddish required. from 6:00 to 8:30 PM at The Marseilles, 230 West 103 St, New York City. The JPPC performs only in Yiddish. Knowledge of Yiddish is *not* required to sing in the Chorus. perform in New York City! with Conductor Binyumen Schaechter, and two other choruses: Cantigas Women’s Choir, and the NYU Madrigal Singers. 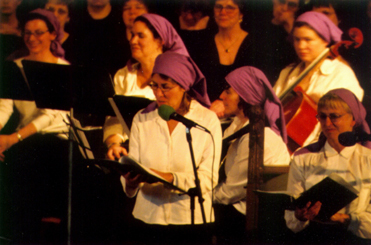 In her last year, Debbie Friedman composed a new melody to the Shabbat hymn “Shalom Aleichem”. What: Afn pripetshik, Der Rebe Elimeylekh, Tum balalayke, Bulbes and a great bouquet of less-known Yiddish folksongs. The Jewish Chorale of France is directed by Hector Sabo. The amateur male choir meets in Paris and rehearse regularly. The website contains photos and some clips. Tickets A$30/$20. Groups over 10 Discounts available. Are you a HaZamirnik who can’t wait to grace the Lincoln Center stage? Are you a HaZamir Alum interested in reuniting with friends and singing a set with other Alumni? 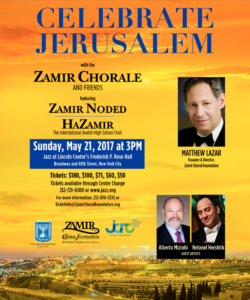 Are you someone who just can’t get enough of HaZamir: The International Jewish High School Choir? Join us on this momentous occasion as we celebrate HaZamir’s 18th Anniversary in concert. Elie Wiesel is best known as the one who will not let the world forget…..
and poignant as he sang the songs of his youth. A Yiddish event is happening this Sunday (Aug. 8th). Fargenign, a Russian Yiddish choir from Lynn, will be performing over brunch at Temple B’Nai Israel in Revere. The event is this coming Sunday, August 8th, at 10 AM. If you would like to come please RSVP as soon as possible by e-mail (reservation@tbirevere.org) or by phone (781-284-8388). $10 adults/$4 children. The congregation is located at 1 Wave Avenue, Revere, MA 02151 (Corner of Atlantic & Wave), in walking distance of the Beachmont stop on the Blue line and a few minutes away from Revere Beach. Saturday, December 12th at 7:00 p.m.
Discount for Advance Sales for all tickets. critical raves and fans among Jews and non-Jewish audiences alike. 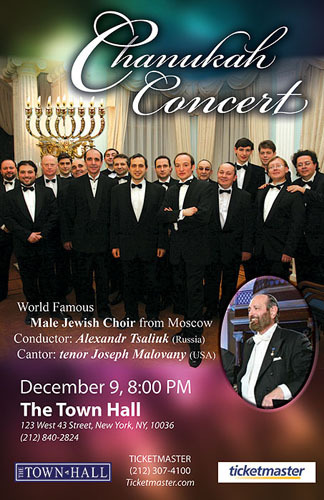 Hebrew and Russian folksongs, classics and international favorites. Tickets, $40 – $80, are available at Ticketmaster, 212-307-4100 www.ticketmaster.com. 77 St. Stephen Street at the corner of Gainsborough Street. evening of 14 June 2009 at St John’s Smith Square London SW1. This is the third year Zemel is participating, and the chorus is planning something a little bit different. $150 (dress circle), $45 (front reserved), $35 (front unreserved), $25 (house) http://tinyurl.com/Tickets-for-Performance or 866.811.4111. 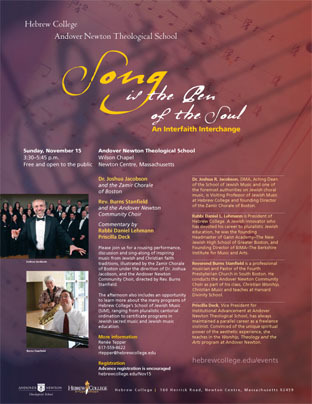 Stirring images of nature infuse Jewish choral music with singular magic. 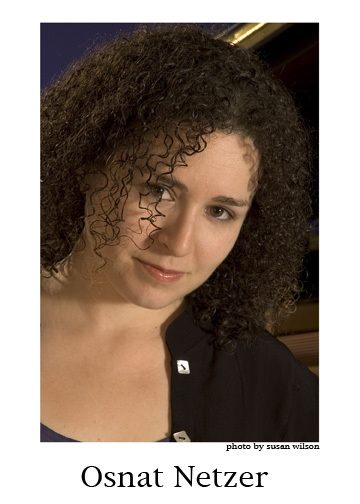 Richly fanciful depictions of the natural world – expressed in psalms, folk songs, and contemporary poetry – inspire this program, which will be presented in Hebrew, Ladino, Yiddish, and English.